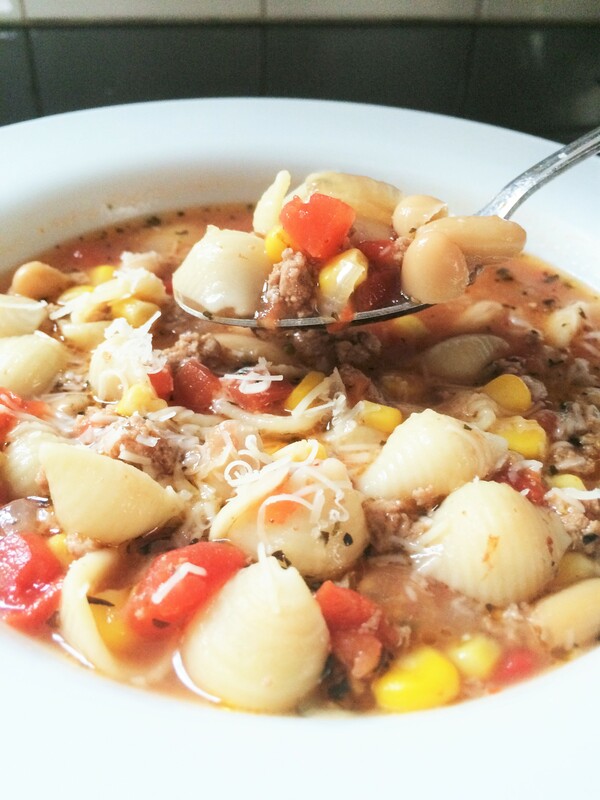 The original recipe is called, Hamburger Minestrone. A few ingredients used in the original recipe that I don’t always use are: 1 stalk celery, thinly sliced (about 1 cup), 1 small zucchini, sliced (about 1 cup), 1 cup shredded cabbage. Now, if it were just me eating this soup, I would add all the veggies. There’s something about chunks of zucchini and cabbage that creates my kids to complain a tad too much! I try to find a balance in picking my battles while occasionally adding all veggies to see if this time around they just might find a liking to it. The taste and texture is SUPER with those ingredients added! However, it does taste pretty darn good minus the extra veggies too. The trick to adding more depth to this soup is in the broth. I say that because there was a time that I ran out of the amount of beef broth needed to make this a soup vs. a stew (meaning it was too thick and the macaroni soaks the broth up too). Chicken broth came to my rescue! I always seem to have a leftover container of broth in my refrigerator. I ended up using part beef broth and part chicken broth. That night the kids asked, with a pleasant almost excited tone, what I did different because the soup was extra good this time. I told them I added chicken broth. Casual shakes of their heads and raised brows to signify an “oh….ok” expression. This is what I would call a cool mom moment! I tend to get excited when my kids can detect a change (and actually like it) or even tell me what they think the change is. My daughter usually nails what the change is. I’m going to miss her and her adventurous palette when she’s off to college in a few months. There have been many times that I have subbed ground turkey instead of ground beef. I have also added vegetable broth along with the other two broths. Sometimes I omit the onion (only because I’m in a major time crunch and looking for a shortcut to get dinner done pronto!). If you want to sub the kidney beans for another bean please do (I certainly have)! Pick your favorite type of tomato….whole, diced, or petite diced tomatoes. The idea is to keep it simple. This is a healthy quick meal for all you busy parents. Cook ground meat, onion and garlic in a large pot, stirring occasionally, until meat is brown: drain. Stir in remaining ingredients except the grated cheese. Heat to boiling; reduce heat. Cover and simmer about 15 minutes, stirring occasionally, until macaroni is tender. Serve with grated cheese. Tip: The cooked macaroni will continue to adsorb the liquid. Add more broth as needed. It’s that simple. Tip: If you don’t have boxed broth you can make your own by adding bouillon cubes or soup base to water. Read the back of the label of each jar to see amounts of water to seasoning. Tip: If you have parmesan rind( that hard crust on rim of your parmesan block or wedge), cut it off from the rest of the cheese and add it to the soup. 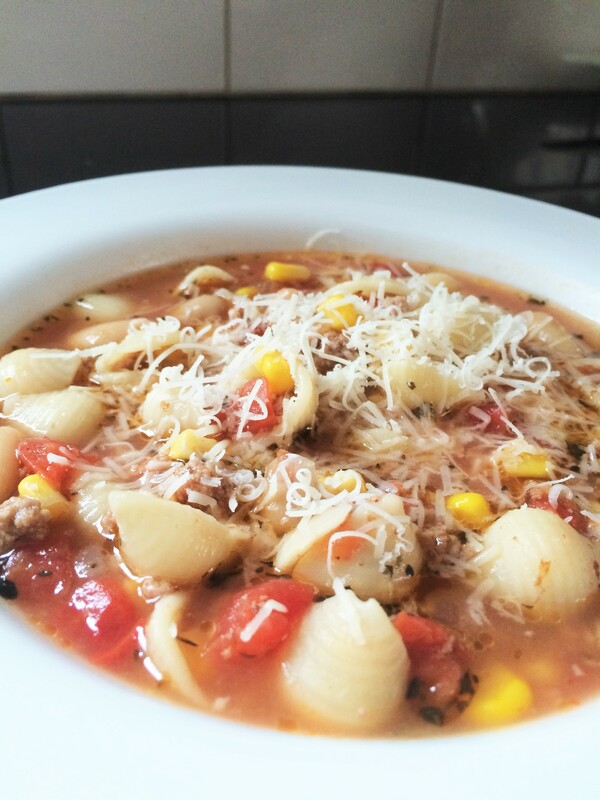 Parmesan rind adds that special extra something to your soups. Tip: Want to make this vegetarian? Omit the ground meat and add more beans. Omit the beef and chicken broths and only use vegetable broth.